The first person to create a channel automatically becomes the Channel Operator or Op. Ops have special powers to manage the channel. Anyone who is a Op can give Channel Operator powers to any other user. Anyone on mIRC can create a channel, as long as the name you select for the new channel is not already in use. Ops are easy to identify. They all have an @ in front of their nicknames. Usually the op is the person who started the channel, and quite often this person will pass on ops status to people/individuals they trust and respect; therefore, it is not uncommon to enter a channel to find several channel operators. 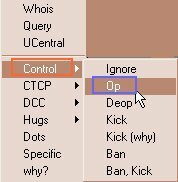 In your mIRC channel window, if you right-click on a nickname, you'll see a list of choices under Control. These are only useful when you are an Op. Here is where you make someone an op or deop them, take away op powers. Op have the ability to kick someone out of a channel temporarily or ban them as long as the channel stays active. 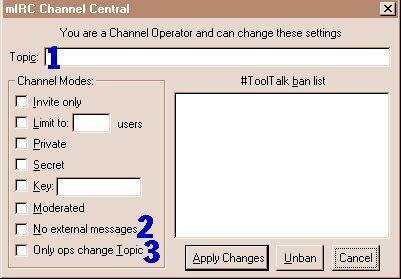 If you double-click on the chat area in a channel window with the left mouse button, a list of things which Op can do to the channel will pop up. This menu is called "mIRC Channel Central." The chat area of the channel window is the left portion where typed text appears. The menu gives a number of options for controlling the channel. There are three features you need to know at the beginning. Set the Topic of the Channel. The topic is like a title of a book. It gives a quick description of what is to follow. The topic of your channel goes at the top of the channel window for all who enter to see. When you have several small groups collaborating during your class, this will assist the students in locating their group. Doing this cuts down on the amount of people you will have wondering into the wrong group. The channel topic will also appear in the /list command, so students will be able to identify before joining what the channels focus is. 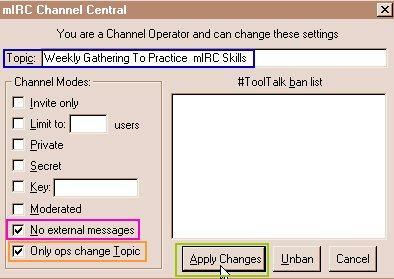 /topic #ToolTalk Weekly Gathering to Practice mIRC Skills. Check the box: No external messages. This prevents disruptive messages from outside the channel. The one down side is that you will not be able to send a message to all the channels you are moderating. Check the box: Only ops change Topic This maintains the stable identity of the channel. If the Op doesn't set this, any member of the channel can change the Topic. After you have entered this information, click on Apply to make the changes.